Currently UFood is greatly expanding: with restaurants in the East Coast, Midwest and South and expanding to the West Coast. People love the lighter nutritious delicious menu that UFood Grill brings to the Fast-Casual Market. If you’re serious about Investing in Franchises, UFood Grill has a top-notch menu that caters to people wanting a healthier low-carb, gluten free, vegetarian, or low-fat meal. While costs vary depending on the location of the franchise site, construction needs and other variables, the estimated franchise investment for this healthy food franchise is listed below. We recommend franchisees get investment pre-qualification and lending options where needed. 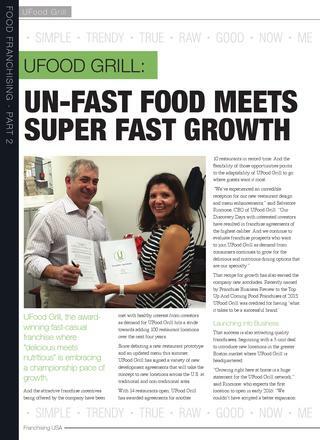 Learn what the industry renowned magazine Franchising USA has to say about UFood Grill.